As night must fall and swallow sun? This entry was posted in Earth, Poetry and tagged aims, ambitions, dark, delusion, frustration, hope, Life, mythology, pointlessness, prompt, sisyphus. Bookmark the permalink. I think you nailed it very well Helen, plenty of frustration in your words. Thoroughly enjoyed Helen, thank you, your frustrations and discontent felt. Amazing rhythm and so well written! A true pleasure to read! 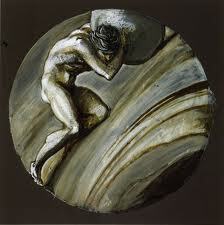 Hate when I have a Sisyphus moment. The poem really made the frustration clear. That last line was great. Reminds me of the old saying “I have met the enemy and he are us.” Nice job. I truly feel it. Sometimes I have wondered if I am hated by the Deities and this is why I have had to struggle so.